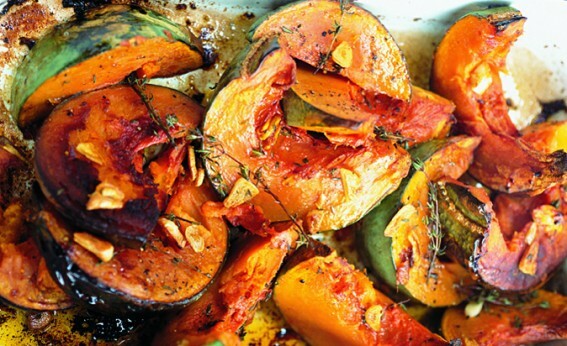 Use the sweeter varieties of squash or pumpkin for this. The pale-greenskinned Crown Prince has a great flavour, and butternut squash is also very dependable. Halve the squash and scoop out and discard the seeds and fibres. Cut into slices about 2cm (¾ in) thick at the thickest part. Put the olive oil and butter in a shallow roasting tin and heat gently. Add the wedges of squash and season well. Pull the leaves off the thyme and scatter those on, too, with some seasoning. Turn the wedges over, making sure you get herbs, fat and seasoning all over them. Put into an oven preheated to 190ºC/375ºF/gas mark 5 and roast for 30-35 minutes, or until tender and slightly caramelized. Baste the squash pieces every so often while they’re cooking and sprinkle the garlic over 15 minutes before the end of cooking time. Make as above, but sprinkle the squash slices with 2 shredded red chillies (halved and deseeded first) and finely chopped ginger (peel and chop a 5cm/2in square of fresh root ginger) 15 minutes before the end of cooking time.